cherna, cherne, L. Epinephelus marginatus, Ar. manānī, Eng. grouper, dusky grouper. It is found in the Atlantic as far as England but it is very rare even in the southern part of the island. It is more commonly found on southern coasts of the Iberian Atlantic and the southern Atlantic Ocean. 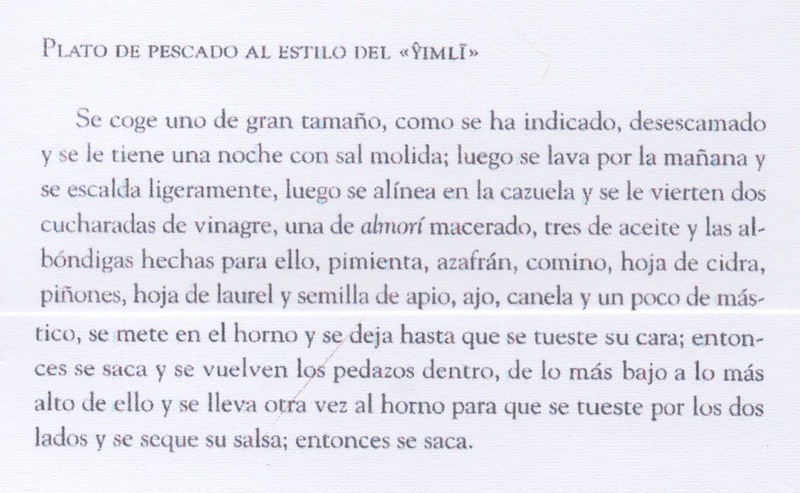 Gonzalo del Bercero (1220-1250) listed it as a common fish in Spain. Consumption in Guipuzcoa is reported to have been large. Villena in the 15th C confirmed the former fact and advised it to be carved lengthwise like sturgeon (see esturión). this fish for if it realizes that it is being chased it swims into very deep water. It is not active in winter. It is a tropical food fish from 1.2-1.5 m. long. 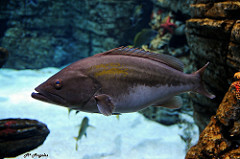 The grouper can weigh up to 50 kg and live 50 years. It is dark brown on top, with three white spots, and yellow underneath. It is prized in the Mediterranean for the excellent quality of flesh. 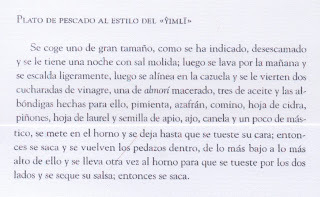 There is a Spanish proverb, “De la mar el mero y de la tierra, el carnero,” (‘From the sea grouper and from the land lamb’ insinuatis that is a good diet’). How to Pamper Your Best Friend! Select a large grouper or other fish. Scale it. Make a bed of salt. Place the fish in this and cover with salt. Leave overnight. The next morning remove the salt. Wash it and scald it in a pan large enough to hold the fish. Save the water from scalding. It should be between 2 and 2 ½ cups. Make fish meatballs with any fish available by removing the skin and flaking it. Mix with parsley and eggs. Form balls and coat with breadcrumbs and set aside. Make a sauce mixing the ingredients as indicated above. Select a pan big enough to hold the whole fish and meatballs. Mix the sauce with the water from scalding and pour it over the fish. Place in preheated oven. Watch carefully and add more water as necessary. When the top side of the fish is brown, remove from oven and turn over all the fish and the meatballs. Return to the oven and browns the other sides. Remove before the sauce burns. If more sauce is needed make one with the ingredients above. Put them in a saucepan and bring to a boil. Strain and set aside until ready to serve. 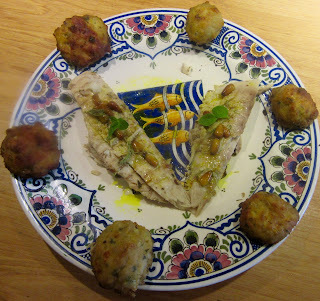 Serve the fish on a large platter intact with sauce on the side. Mero was not used as it is so expensive. Pomfret was used as a substitute for its white meat and simular appearance.